The course, organized in the context of the iNEXT Horizon2020 project , covers the main approaches for the characterization of structure and dynamics of biomolecules in solution. It integrates solution NMR, paramagnetic NMR, small angle X-ray scattering, dynamic light scattering and fluorescence methods, providing the basic principles for each technique, the applicability to biological systems, and the major benefits and limitations. The course is organized with lectures in the mornings followed by hands-on training. Participants will give a flash presentation about their work and bring a poster. The course is aimed primarily at PhD students, young Post-Docs and researchers interested in structural biology. 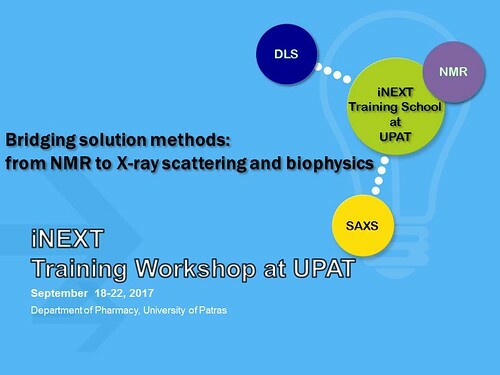 The Workshop will be held at the Department of Pharmacy, University of Patras.